getcalc.com's multiple fractions & mixed numbers addition calculator is an online basic math function tool to find equivalent fraction for addition between two or more fractional numbers with same or different (equal or unlike) denominators, mixed and whole numbers. Users may use this calculator to generate complete workout for the given input values to verify or practice the fractions & mixed numbers addition worksheet problems with step by step calculations. To know or verify the addition between multiple fractions calculation, supply the input values to generate the complete workout with step by step calculation to help elementary or grade school students to solve the worksheet or homework problems efficiently. To use mixed numbers in this fractions addition calculator, users are not required to convert the mixed numbers to its equivalent fractions seperately, instead users can use the mixed numbers directly in the format of X(Y/Z); where X is an integer, Y and Z are the numerator and denominator of the fraction. For example, a mixed number 3 1/2 should be provided as 3(1/2) in the calculator. Multiple Fractions Addition is a basic arithmetic operation which combines two or more fractions together. The below formula is the mathematical representation to add any number of fractions with like or unlike denominators, positive and negative fractions or fractions with whole or mixed numbers. Use this fractions & mixed numbers calculator to verify the results of addition between two or more fractions, mixed numbers & whole numbers. For fractions which are having same or equal denominators, the sum of fractions is equals to the sum of numerators divided by the common denominators, while for fractions with unlike, unequal or different denominators, the sum of fractions is calculated by using the LCM (least common multiple) method. Users may refer the below solved examples with step by step calculation to learn how to find the equivalent fraction by adding two, three or more fraction numbers with same or unlike denominators. How to find sum of multiple positive & negative fraction numbers. The below solved example with step by step calculation or workout may help users to know how to find the equivalent fraction by adding three fractions (with unlike or different denominators) 1/2, 2/3 & 4/5. Find the sum of three fractions with unlike or different denominators such as 1/2, 2/3 & 4/5. step 2 For fractions with different denominators, find the LCM (least common multiple) for all denominators. 30 is the LCM for 2, 3 and 5.
step 4 Simply the above expression to have same denominators for all fractions. 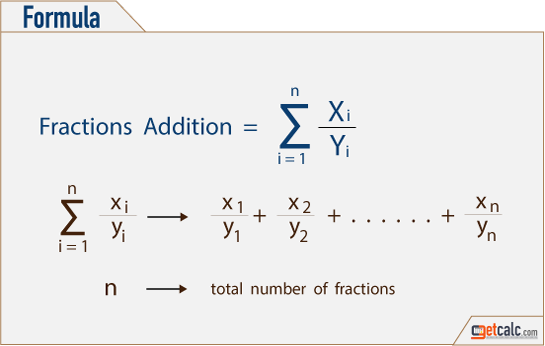 step 5 Add all numerators and rewrite it in a single form. Thus, 59/30 is the equivalent fraction by adding three fractions 1/2, 2/3 & 4/5. The below solved example with step by step calculation or workout may help users to know how to find the equivalent fraction by adding three fractions (with same or equal denominators) 5/9, 7/9 & 4/9. Find the sum of three fractions with same or equal denominators such as 5/9, 7/9 & 4/9. Thus, 16/9 is the equivalent fraction for adding three fractions with same denominators 5/9, 7/9 & 4/9. The below solved example with step by step calculation may help users to know how to find the equivalent fraction by adding multiple fractions (with unlike or different denominators) and whole numbers. Find the equivalent fraction for adding 1/2, 1, 5/3, 2, 1/4, 2/5 & 3. 1/2 + 1 +5/3 + 2 + 1/4 + 2/5 + 3 = ? step 3 Arrange all the numbers as fractions. step 4 Find LCM (least common multiple) for all denominators, if all the denominators are not identical to each other. 60 is the LCM for denominators 2, 1, 3, 1, 4, 5 & 1. Thus, 539/60 is the equivalent fraction for adding multiple fractions and whole numbers such as 1/2, 1, 5/3, 2, 1/4, 2/5 & 3. The below solved example with step by step calculation may help users to know how to find the equivalent fraction by adding multiple positive & negative fractions (with unlike or different denominators). Find the equivalent fraction for adding positive & negative fractions 5/6, 1/3, -2/7, 1/6, -4/7 & 4/5. step 2 Find the LCM (least common multiple) for all denominators, if all the denominators are not identical to each other. 210 is the LCM for denominators 6, 3, 7, 6, 7, & 5. Thus, 202/210 is the equivalent fraction for adding multiple positive & negative fractions 5/6 + 1/3 + (-2/7) + 1/6 + (-4/7) + 4/5. Find the equivalent fraction for adding multiple fractions, mixed & whole numbers 1/2, 1/3, 1/4, 6, 7(1/5), 8(1/6) & 1/7. 1/2+1/3+1/4 + 6 + 71/5+ 8 1/6 +1/7 = ? step 4 Arrange all the numbers as fractions. step 5 For fractions with different denominators, find the LCM (least common multiple) for all denominators. 420 is the LCM for 2, 3, 4, 1, 5, 6 and 7. Thus, 3163/140 is the equivalent fraction for adding multiple fractions, mixed & whole numbers 1/2 + 1/3 + 1/4 + 6 + 7(1/5) + 8(1/6) + 1/7.